Originally posted 02/26/04 by rob-ART morgan, mad scientist. PROBLEM: The G5 Power Mac only has room for 2 SATA drives inside. I don't really want to use external drives. Isn't there a way to squeeze one or two more drives inside that big case? 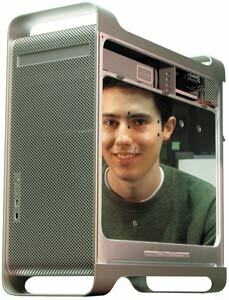 PROBLEM: I want to create a 4 drive 1000 gigabyte RAID set but the G5 Power Mac only has room for 2 drives inside. Even if I boot from a FireWire 800 drive, that only gives me a 500 gigabyte total (2 x 250GB) for the internal RAID set. I sure wish I could sneak two more 250GB drives inside. Why do you need 4 drives? Many digital video editing labs are trying to capture HDTV format uncompressed. Depending on the frame rate and resolution, you need write speeds of at least 120 megabytes per second (MB/s) and as high as 180MB/s. If you stripe four drives into a RAID 0 set, you should get 200MB/s+ sustained read and write speed. 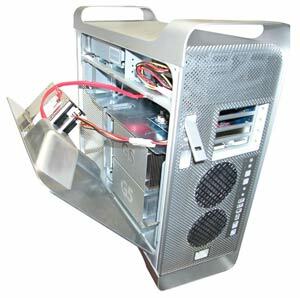 JAZZY SOLUTION: Wiebetech has engineered an innovative solution for adding two more drives INSIDE the G5 Power Mac. It's called "G5Jam." They actually replace the G5's plastic air baffle with a machined aluminum air baffle strong enough to mount two drives. When you install it, the drives are suspended in the PCI bay. Very cool. So cool, it won one of the "Best of Show" awards at the January 2004 MacWorld S.F. The kit comes with two Serial ATA cables, standard power cables, and illustrated instructions. You can buy the G5Jam with or without drives. I already had two Hitachi 7K250 SATA drives I wanted to mount so I installed them on the aluminum baffle plate using the screws provided by Wiebetech. Power for the drives is pulled off one of the factory SATA drives. That's actually a cleaner solution than ATI uses for the retail Radeon 9800 Pro, which requires you to remove the optical drive, add a "Y" and reinstall it. Once attached to the plate, CAREFULLY connect the data cables to the drives and the included FirmTek SeriTek/1S2 controller card. I say "carefully," because during the past 8 months of SATA testing I've broken off the SATA data connectors on two controller cards and one drive. And I'm not clumsy. Once the data and power cables are tucked away, you can close the aluminum baffle and replace the G5's outer cover. Any "gotchas" I should know about? If you have other PCI cards in your G5, I recommend installing the SeriTek SATA controller in the number 4 PCI-X (133MHz slot closest to the top of the G5). It's on a separate bus, so there won't be any "throughput collisions" with any other PCI cards in the bay. Note the speed dropped as the file size increased. But even at 5GB, the sustained write speed was above the "HDTV" desired speed. However, as you fill up the volume, the speed drops off dramatically. That's why I suggest using SoftRAID which lets you partition the RAID set to avoid the slow section. And think about it: Though those who pop for 10,000rpm SATA Raptor RAID arrays and 15,000rpm UltraWide SCSI RAID arrays brag that they get 180MB/s+ right up to 90% capacity, four of those drives only gives you 280GB total. You can store twice that much on a four 250GB SATA RAID without dropping below 180MB/s. What about the external SATA boxes? ProMax has an interesting two drive and four drive external SATA enclosure. But until there is a Mac compatible SATA controller with external ports, that scenario will require you to run cables out an empty PCI slot. What's really needed, if you prefer an external SATA storage solution, is a true PCI-X SATA controller with external ports -- preferably one with 4 channels! Yeah! One reader created his own external SATA solution using two $50 PPA Inc. SATA case kits from Frys Electronics, but again, he had to leave one PCI slot empty and run the SATA data cables through the empty slot. The G5Jam Rocks! It fixes the one glaring fault in the design of the G5 Power Mac: limited internal drive expansion. It's a great product for "Power Users" who want to have maximum storage with minimum external clutter. 1. Cooling - the G5's PCI bay cooling system and spacing of the drives by the G5Jam takes care of the heat issue. 2. Stability - The G5Jam insures that the drives are solidly mounted. Without a solid mounting, the resonance or vibration will shorten the life of the drives. SoftRAID versus Apple RAID -- features compared. My favorite SoftRAID feature is "custom volume sizes," which lets you isolate the fastest portion of your RAID set. An alternate product that adds THREE drives to the G5: The SwiftData 200 by TransIntl.com. The G5Jam was provided courtesy of WiebeTech. You can buy the kit with or without drives. Our Hitachi 7K250 Serial ATA drives were provided courtesy of Trans International and Hitachi. Be sure to check TransIntl.com for pricing. Check also with Other World Computing. The best performing Serial ATA PCI host adapter we've tested is the $69.95 SeriTek/1S2 courtesy of FirmTek (although Wiebetech includes one with the G5Jam kit). This card works on all Macs with PCI or PCI-X slots. It is available direct from FirmTek's online store for $69.95. Check also with Other World Computing and Trans International. Sonnet Technology will sell you a purple version (Tempo Serial ATA) for $99.95.